Note: This Artist Feature is part of an ongoing series to document the female artists whose articles were added or improved on Wikipedia during the Art + Feminism edit-a-thon I co-organised in March 2016. Movement/Style: Contemporary photography and video art. Years: 1960 – still alive! 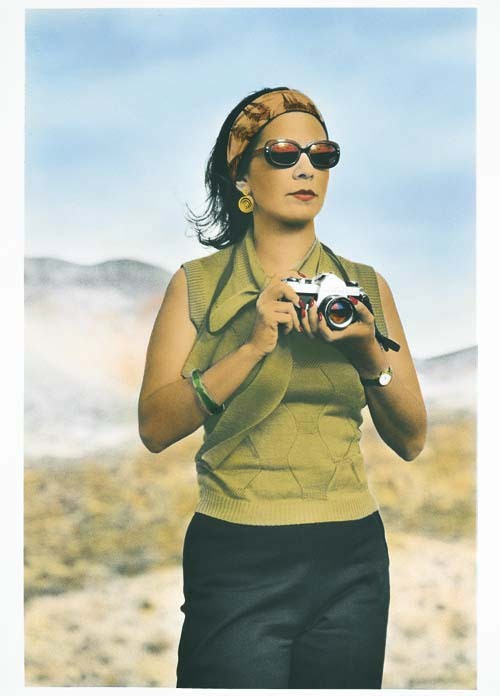 Tracey Moffatt is one of Australia’s most famous and internationally renowned artists. She works with both film and photography and her work is very cinematic and theatrical. She’s especially famous for her dramatically staged narrative photographs. 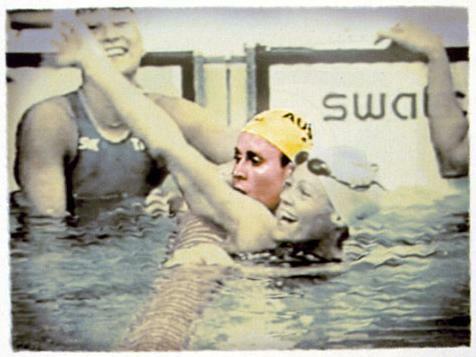 Certain themes tend to reoccur in Moffatt’s work: race – specifically Indigenous Australian identity; constructions of narrative; fame and celebrity. The overall point of her art is to examine the notion of storytelling. She questions the conventions of narrative. She frequently uses artifice in her work; visual aspects that draw attention to the artificiality of the image. This can mean, for example, obviously staged or posed photographs, the use of painted landscapes in the background of a video, or the manipulation of sounds and images. By using artifice she reveals how narratives are constructed and manipulated. Moffatt has been quoted as saying that, “Every piece I have ever made…is in some way autobiographical. Each work depicts a mood or a current obsession.” Although this statement explains her penchant for posing as various ‘roles’ in her photographs, it doesn’t give us any significant ideas about how much Moffat’s own life influenced her various artworks, given their constructed and artificial nature. We can say, however, that many of the themes Moffatt works with – race, Indigenous Australian identity, gender, family – are important aspects of her own life. Moffatt was born to an Indigenous Australian mother and an Irish father, but was adopted into a white family in the suburbs of Brisbane. Her birth mother would visit her and accustom her to Indigenous identity, leaving her in the powerful position of taking part in two separate cultures growing up. Many of her early works were, subsequently, explorations of racial identity from an in Indigenous Australian perspective. As an artist, Moffatt has always been willing to communicate with her audience and articulate her artistic process. In her later years, as her fame has grown, many of her works have begun to explore notions of fame and celebrity. The Something More series, consisting of nine photographs, is one of Moffatt’s most iconic works. By being presented as a series of carefully staged, theatrical photographs, the work suggests a fragmented narrative dealing with issues of race, violence, and a deep emotional resonance. In Something More #1, Moffatt herself appears as the main character in the foreground. The background behind her is colourful and artificial; however, her expression centres the image, suggesting hope and wistfulness. Together with Something More, Night Cries was one of the works that brought Moffatt true international attention. 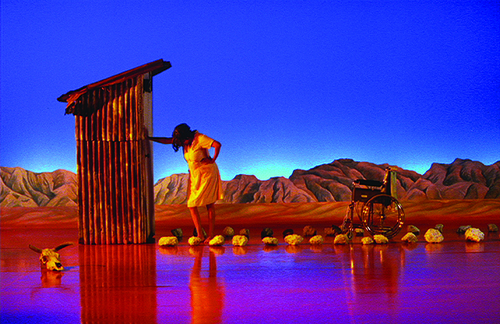 The video work tells the story of an Indigenous Australian woman who has to care for her aging white mother. The work deals with issues of colonialism, emphasised by the repetition of footage of famous Indigenous Australian singer Jimmy Little, singing a Christian song (referencing the missionary movement that attempted to assimilate Indigenous Australians into a Christian culture). More than that, however, it deals with how the personal and the political are entangled in complicated ways.